A book tour stop brought to Butterfly-o-Meter Books by Bewitching Book Tours. I had fun reading this book, there were tense moments and funny ones, also intense and dramatic, totally fun. 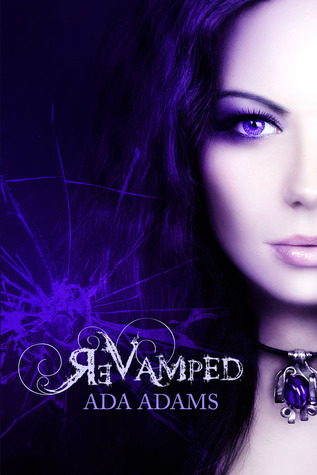 The vampires of ReVamped are really cool, made and born, the kickass types. They train, fight, plot and scheme. And they drink Blood Cola for freak’s sake, how awesome is that? They have all these blood derived things to eat, like fast blood-food and stuff. I bet they have the blood puffs too, I mean seriously awesome. Loved it. The world of the novel is I think my favorite part, I mean the whole Scarlet House and the President angle, I was completely in love with the world of the novel. The writing was accessible and the voice of the narrative was clear, though I think I would have had more fun if there would have been a bit more humor to it. I’m not saying this should be a comedy, but you guys know already I always fall for humor, even (or perhaps especially in) tense situations and accounts. And last but not least, that cover is just ridiculous. Who’s that gorgeous, seriously? That chick on the cover is like outrageously gorgeous. This is that type of cover that definitely sells, I’d like posters of it or something, lol. Awesome. If you judge the book by its cover you will find it’s a good match. Give it a try. I ordered Seth to wait in the car and slowly made my way up the dirt path in the direction of what I had hoped was Sebastian’s residence. The longer I walked, the darker and more daunting the clouds above became. Finally, with a booming crash of thunder, the sky tore open, releasing a fresh downpour of cool rain. This time it was faster and heavier, pummeling against Hannah’s note and drenching her small, neat writing. I considered turning back and meeting with Sebastian another time, but my curiosity got the best of me. I examined Hannah’s note, squinting to make out some of the smudged words. Sebastian York is a twenty-one year-old Scorpio. He has gorgeous light gray eyes, the color of sparkling glaciers. His midnight-black hair is slightly curly and just long enough to make you daydream about running your fingers through his locks. He’s super tall and really, really hot. Just try to peel your eyes away from all those lean muscles! Yum! He’s brooding, mysterious, strong, and self-deprecating (or at least he seems like the type)—the perfect vampire! I had to stop myself from reading the rest. Hannah’s report on Sebastian was a little over-the-top for my taste. Not to mention, much too unbelievable. I scrunched up the soaked paper and tucked it into the pocket of my jeans. I smiled to myself, thinking that the bubbly redhead had a promising career ahead of her as a writer of cheesy romance novels. The hike through the forest led to a secluded clearing. The trees parted, revealing a striking building more akin to a grand mansion, than a house in the woods. While made in the same style as the buildings in town, the three-storey structure had a stately, regal air about it. Clad in white stone with Grecian temple-inspired columns towering across its entire façade, it very much resembled the majestic inn on the grounds of the Angel Creek Park. The driveway finally came to an end and I found myself next to a luxury antique car. Its cherry-red hood was propped wide open, so it took a moment before I noticed that there was a figure tinkering with the machinery underneath. He wore a pair of loose, black pants, the muscles on his bare back flexing as he strained to tighten something with a metal wrench. Hannah’s words flashed through my mind as I stood frozen in place, observing Sebastian’s profile. My gaze traveled along his tall, lean body, to his face, gliding over his sharp angular jaw and high cheekbones, and, finally, finding a resting place on his dark locks. Embarrassed by my unexpected attraction to the vampire in front of me, I sharply looked away, thankful for the cooling sensation of the wet raindrops against my skin. Suddenly, Sebastian sensed my presence. His entire body tensed as he spun around, the wrench firmly grasped in his hand, ready and poised for an attack. The moment his eyes fixed on me, he froze, a look of sheer terror seizing his face. The metal tool fell out of his hand, hitting the cobblestone with a loud clank. The noise seemed to break the spell he was under. As his gaze connected with mine, the look of horror that came over him just moments before, immediately vanished. “Sebastian?” I asked breathlessly, unnerved by his startling reaction. He didn’t reply. Instead, he continued to examine every inch of me with his cool, gray eyes. My entire body blazed under his scrutinizing stare, but despite the uneasiness, I couldn’t bring myself to look away from him. The strong wind frantically tugged at my hair, as if trying to snap me out of my trance. In spite of nature’s best efforts, I simply stood there, locked in an unnerving staring contest with the mysterious vampire. A deafening clap of thunder shook the earth, causing me to jump, and startling Sebastian back to his senses. “Who wants to know?” he finally responded. There was a sharp edge to his smooth voice. “My name is Dawn,” I said, attempting a smile. “I’m here on an assignment from the Vampire President to train the new guardians of Angel Creek. Since you’re one of the five vampire residents, I thought you’d want to know about the mission and take part—” I paused abruptly, distracted by the angry scowl forming across his face. Another earsplitting roar of thunder sounded before he spoke. “Not interested.” he said curtly, his eyes still intent on me. He was boldly exploring my face, his gaze slowly traveling down my body. “Dawn, did you say?” he asked curiously, his voice a little less brisk. I nodded, crossing my arms in a self-conscious effort to shield myself from his gaze. “So can we count you in?” I asked hopefully. “What do you mean no?” I asked in disbelief. I was quickly becoming annoyed with the shirtless, ill-mannered vampire. “Yes, really—no.” He turned away, waving his hand in my direction as if to let me know I was dismissed. “Why?” I asked, stretching out to grab his arm. Thankfully, he had moved just before I could reach him, as mid-grab, I realized that touching Sebastian was a bold move that I had not fully thought out. “What about your obligation to protect humans?” I questioned. “But, but…you can’t do that. When I tell the President that you’re here, he’ll order you to join the group.” I was grasping at straws. All of a sudden, Sebastian charged toward me, thrusting his face into mine. He was so close our noses almost touched. As I raised my eyes to meet his, the raindrops from his glistening locks dripped onto my forehead. I resisted the temptation to blink as droplets of water fell onto my eyelashes, not wanting to show him any weakness. “For the past century I’ve been doing exactly what I want, when I want. I don’t owe anything to any human or vampire—especially not the President. Now, leave before I make you leave!” he said through clenched teeth. “Fine!” I yelled, pressing my fists tightly against my legs in an effort to prevent myself from striking him. “But, just so you know, you’re a really sucky vampire.” I mentally kicked myself for the lame retort, also chastising myself for having wanted this aggravating snob to join the group. “Please don’t come around here anymore.” With those final words, Sebastian stormed off into the house, slamming the heavy door behind him. I was left alone on the wet driveway; feeling confused, angry, and somewhat excited by our meeting. That evening, nestled in the small, cozy cottage in the depths of the Angel Creek forest, I glumly surveyed the vampires gathered around the dining room table. Hunter was resting his head on the linen tablecloth, struggling to stay awake. Every so often, he would succeed in lifting his heavy lids and focusing his eyes on me, only to instantly retreat into his intoxicated coma. Sophie sat to Hunter’s right, her forehead scrunched tightly as she squinted at the tiny print of her historical fiction novel. Her pupils moved at lightning speed as her eyes traversed the pages of the book, hungrily devouring the story. Across from them, Brooke was polishing her nails with a sharp, pink file. She paused after each stroke to carefully inspect her nails and ensure that she was creating the perfect shape. Seth sat at the foot of the table, a large head of garlic in his hand. He peeled off a clove and popped it into his mouth, wincing as the bitter flavor reached his taste buds. All the while, he shot dirty looks in Brooke’s direction. Drawing in a deep, calming breath, I launched into a short speech I had prepared earlier in the day. “Congratulations new vampire recruits! The four of you are now the official guardians of Angel Creek. This is both a great honor and an important task. Are you ready to band together and work with me?” I asked with as much excitement as I could muster. “Hmm?” Hunter murmured, raising his head. It was the best I was going to get, I realized. “Tomorrow morning we begin our train—” Before I had a chance to finish my sentence, a sudden blur of movement in the woods caught my attention. I only saw it for a split second, but it was enough to convince me that someone was lurking outside. Someone had found our secret location. Not wanting to panic the recruits, I casually made my way to one of the dining room windows. Wiping away layers of dust that clouded the glass pane, I pressed my forehead against its cool surface, scanning the horizon for the origin of the activity. It was difficult to make out through the thick sheets of rain, but right at the edge of the forest, concealed by the shadowy trees, stood a tall, dark silhouette. From its frame alone, I could not tell if it belonged to a human, a vampire, or some other being altogether. I was only sure of one thing—it was watching us. I rushed outside to investigate, but by the time I had reached its hiding spot, the stranger had vanished into the darkness. Do you end up buying books on impulse because of the covers a lot? How often would you say the book delivers?